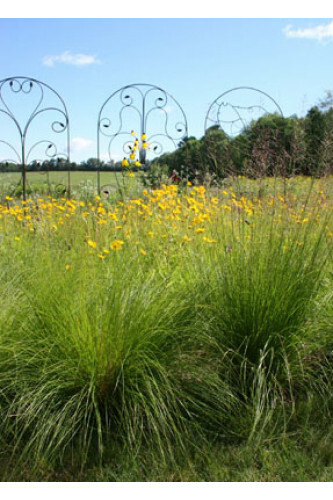 Prairie Dropseed adds a touch of elegance to almost any planting. Shown here planted with Lanceleaf Coreopsis, Sporobolus heterolepis is often considered to be the most handsome of the native grasses. It makes a well defined and very distinctive border when planted eighteen to twenty-four inches apart and the seedhead has a faint but unmistakable fragrance somewhat like cilantro.